Just 4 days after it launched on iOS as an invite-only timed exclusive, the immensely popular battle royale game Fortnite has topped the App Store charts in 13 countries and has raked in a cool $1.5 million for developer Epic games. The latest data from Sensor Tower suggests that $1 million was spent by players in the first 72 hours after the launch. Now, you may be thinking that these numbers are not as impressive, especially when compared to the insane amounts of money that Pokemon Go made in its first days when it launched in 2016, or to the monumental success of Clash Royale, but that's not really a fair comparison. For one, Fortnite is still invite-only and hasn't launched on Android yet, which means it hasn't nearly reached peak popularity. Second, the way it makes money is quite different to how mobile-first games do things. Fortnite is a cross-platform title, meaning that console, PC, and mobile players can duke it out against each other on the same battlefield. Well, Xbox One and PS4 gamers can't play together, but that's a whole different can of worms. So, being cross-platform, the game is functionally the same across all systems. This means that its in-game currency, V-Bucks, can also be purchased on, and used across, all platforms. For example, if you drop $10 on virtual currency on your PS4, you don't have to do it again if you want to buy something in the mobile version. That's really nice, but it also explains why Fortnite on Android and iOS may not reach the exorbitant revenues of games like Pokemon Go and Clash Royale – money is simply being spent across other platforms. 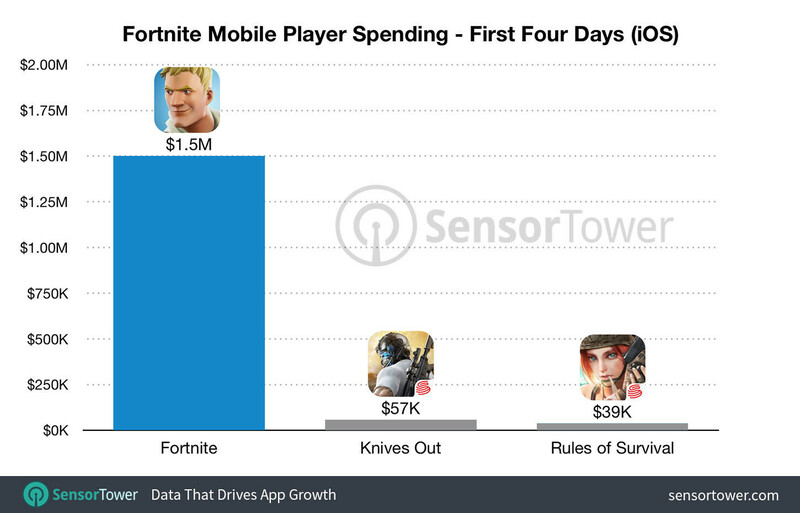 But all that said, Fortnite still absolutely overshadows similar games like Knives Out and Rules of Survival over the same period. So the real reason its "making money" is because with it being cross platform the money is in your Fortnite account. so when you hop back on your PS4 the money is still there. Even though Cross platform between mobile and PC/Console seems like a bad idea for mobile games seeing as controls aren't as smooth.